Add up to four waypoints (pit stops) along the route to your destination. Waypoints allow you to stop for gas or food, for example, and then continue on to your destination. Press the MAP/GUIDE button to return to the map screen without adding a waypoint at any time. The search corridor used for adding waypoints can be adjusted. You can delete waypoints or edit the order of waypoints in the destination list. 1. 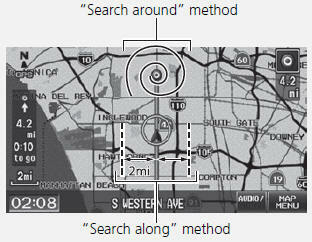 Select a search method to add a waypoint. Searches within a “corridor” on either side of the route. Searches in a spiral pattern around the destination. Searches in a spiral pattern around the location you select. 2. Select the location when you select Places Around the Waypoint. 3. Select a waypoint category (e.g., Auto Service). 4. Select a waypoint subcategory (e.g., GAS STATION). ► The waypoint is added to the destination list. 1. Select a new address or location. 2. Select ADD TO My Dest. in the destination list. Select OK.